One of the rites of motherhood is knowing how to get baby poop out of clothes. Trust me, this concern will come up within a week of living with your newborn baby. 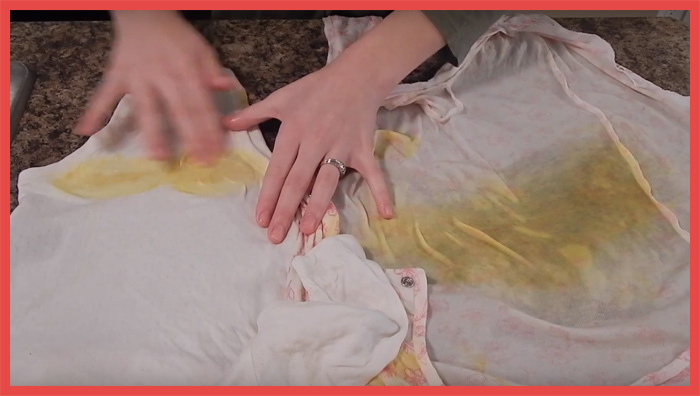 This will be the time you’ll discover that baby poop stains are some of the most stubborn, most annoying and perhaps the most maddening of stains you’ll be going up against your entire life. I learned this the hard way. This was actually way back before you could Google “how to get baby poop out of clothes” and find a suitable answer. The mustard-colored enemy was persistent, and I was determined to remove it from existence. Boy, was I in for a frustrating time. I used to soak my baby’s clothing overnight. Spot treated it. Laid it out on the sun. But nothing worked. There was always a residue in the form of strange yellow patches and small yellow stains. Call it a blowout, a poonami, or whatever you could come up with in defiance (I called it the Voldemort, or the Stain That Shall Not Be Named). But in my mind, I could have saved those clothes for my next little one! As luck would have it, I discovered the easiest fix on how to get baby poop stains out of clothes. Funnily enough, I was waiting for my greatest enemy to appear so I could see the dish soap method for myself. It happened in the middle of mass, and I was sure that everyone within an aisle radius heard the poop explosion. We got home and sure enough, there was the dreaded poop stain just right in the middle of the inside of her onesie. I carefully removed her clothes so the stain wouldn’t spread and ruin the outfit. Step 1. I ran the clothing under cold water to remove as much of the stain as possible before treating it. In instances where you won’t be able to run it by the laundry ASAP, get a pan and fill it with cold water. Submerge the clothing in until you can wash it properly. The key here is to prevent the stain from setting in. Cold water soaks are excellent at this kind of thing. More often than not, you’ll have a thousand other things to do before you can attend to the poop stains. So remember- cold water is your best friend! Step 2. You will need to use any dish soap, for this example I used Sunlight but I recommend to use my favorite one Dawn Ultra Dishwashing Liquid Soap and wash the outfit. Rub it in baby’s clothing and build up a nice lather. Cover the whole stain with the liquid soap. Put a concentrated amount onto it and make sure to pay attention to all the affected areas. Afterwards, lay the outfit out for the sun to do its part. Step 3. I threw the outfit into the wash. This time, use warm water. After a cycle of wash and dry, the tiny outfit should come out good as new! Do a quick inspection of the item. Isn’t it amazing how the baby poop stains never happened? What’s great is that this method works even on white clothing. Here’s a different method on how to get baby poop out of clothes. Poop stains aren’t just limited to clothing- you’d know how it can sometimes get onto the bedsheet, carpet, or any other fabric. A bottle, preferably with measurements and a squirter on top like this one. About 2 ounces baking soda, which makes up 20% of the solution. 60% will come from hydrogen peroxide. The remaining 20% will be laundry detergent, preferably Arm & Hammer Complete. When mixed, the solution will turn blue (Photo below). After a few days, it will turn completely white. Don’t worry, this is perfectly normal. Spot the poop stain and take out your DIY poop stain remover. Shake the bottle well before using. Squirt a generous amount of solution to the poop stain, then work it in really well. Let the whole thing sit for a couple of hours. Rinse the outfit in cold water. Let it dry under the sun. Throw it in the laundry and wait. Voila! No more stain. Your fabric is safe and the world is right again. Can I Use a Baby Fabric Softener On My LO’s Laundry?